Born 20 October 1960, three children. After earning his fighter pilot wings in 1984, Philippe Steininger was subsequently posted to operational units in Colmar (1984-1989), Neuburg (1989-1991) in Germany as part of an exchange programme, and Toul (1991-1995). After graduating from the Joint Forces Defence College, he was second-in-command and then leader of a fighter squadron at the Cambrai air base. During this time, he flew numerous missions in Africa, the Balkans and the Near East. From 1999 to 2002, he was the officer writer in charge of air and space matters and transatlantic relations at the Joint Chiefs of Staff in Paris, then, after two years with the Inspectorate General of the French Air Force in Paris, commander of air base 120 in Cazaux from 2004 to 2007. After serving as deputy director with responsibility for European construction and the Atlantic Alliance at the strategic affairs office of the Ministry of Defence from 2007 to 2009, Philippe Steininger was posted to the Secretariat General for National Security and Defence as advisor to the Secretary General, where he headed the advisory secretariat for national security and defence. He was made a General in 2010. He was appointed second in command in 2013 and then commander in 2014 of France’s strategic air forces, before being made Deputy Secretary General for National Security and Defence in 2015, a post he occupied until 2018. 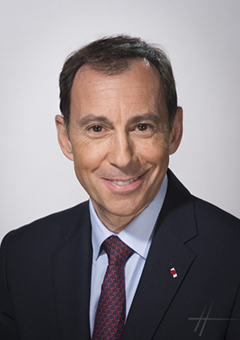 In September 2018, Philippe Steininger joined CNES as military advisor to the President.